In the honour of World Book Day, I thought I would share a post inspired by one of my favourite books. A while ago I watched some You Tube clips of Will Smith, one of my idols, and in one interview with Travis Smiley, Will mentioned the book called The Alchemist written by Paulo Coelho and how it changed his life. If a book has such a profound affect on a great thinker and inspirational guy like Will then I thought it was worth giving it a go. I bought it and read the full thing in less than a week and wasn’t disappointed. Don’t get me wrong it’s not a long book and is so intriguing that you’ll rattle through the 197 pages in no time. What was refreshing and inspiring was that I got the story, I recognised the hidden meanings and what the book was teaching. This book is about a young man searching for his treasure (his meaning of life) and what he learned along the way. If you just read the words and apply no thought to it you will be wasting your time … but if you read it with an open mind and think about your own life you might just find your purpose in life! Some people may think that’s nonsense and that everything that happens is a coincidence. That you get from life what you take from it. Others will know there are no such thing as coincidences, no mistakes, no lucky breaks … that each thing that happens in your life is meant to happen. Fate if you will or signs from the universe that you’re on the right … or wrong track. Feel free to think what you like, I prefer to think that maybe things in life aren’t coincidence, that instead they are a sign. Since reading the book and moving towards my own purpose in life the universe has thrown me one “green light” signal after the other and continues to do so. I’ll keep heading that way and if I get off course I’m sure something will pop up to remind me why I’m here. It may sound a little far fetched … but what have you got to lose. It might just open your mind up to a better future pursuing your own purpose. If you’ve read the book please leave me a comment on what you got from the book or what you thought of it. I felt lost when I first read the book and it inspired me to find my purpose. I’ve been a wild ride since reading it! Thanks for the comment Joey, it’s nice to hear it had a similar impact on others. Yes. Dare to dream and purse your dreams ! Reblogged this on Daily Motivation for Self Improvement. I enjoyed the story, but was starting to lose interest near the end. Today I heard Rhonda Britten say, in an interview, that if you don’t know your purpose, your purpose is to love yourself, and everyone else, and then your purpose will show up. Thank you for those words. As someone always struggling to understand what my purpose is, I needed to hear this. I’m starting to suspect that I’m actually living my purpose and I don’t even know it. I meant about the Alchemist book, not your writing. I read this book years ago and I loved it. I should read it again as there are so much wisdom within it. I too believe there are no coincidences. But we must look at the things that happen to us, ponder our path and really think. Otherwise we miss the boat, and that is when we begin to flounder in life. My project this week is to re-read The Alchemist. Thanks for the reminder/prompt. My life is definitely transitioning so I might as well think like Edison. Great post. I actually got the word “maktub” tattooed on my finger. love the book. We share a similar purpose in life my friend! Thank you for reading my blog! It is the hero’s journey and what all epic myths embrace over and over again. I love The Alchemist and all of Coelho’s writings. I quite enjoyed the book as well. I also suggest ‘Illusions’ by Richard Bach (192 pgs) and ‘The Greatest Salesman in the World’ by Og Mandino (111 pgs) – There’s also a part 2. I think the coolest thing about these books, despite being fiction, is that they get you to think ‘outside the box’ and being open to new perceptions. Or realizing it’s All about perception 🙂 And the power of believing in yourself. 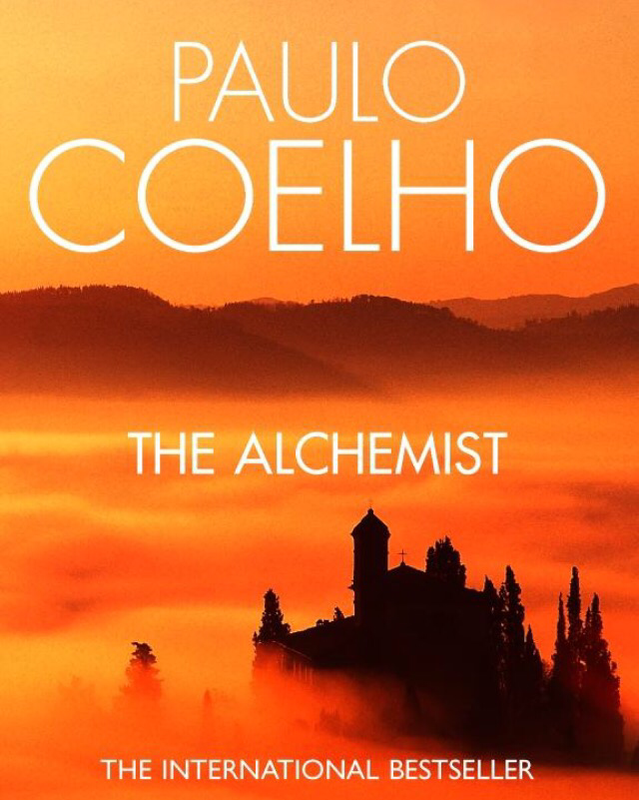 I love ‘The Alchemist’ the best of all Coehlo’s books. and each time I read it, I reaffirm my purpose. Thank you for sharing! I love his books. ‘The Alchemist’ was the first one of his I read and is still my favourite. I love your positive attitude. My dad did a lot of motivational speaking when I was growing up, so we had Zig Ziglar and others lining our bookshelves – all great stuff! Also, thanks for your recent follow of my blog. Nope, not far fetched at all, I too am on the same track, pretty fun ride once you get used to it! I wanted to share this blog post with you because it is here that I first learned of the book, The Alchemist. I enjoyed this post and believe you will too. Have a terrific Tuesday…. I enjoyed reading and listening to the audio version of this book. A must read to anyone who is strating their own business. This is one of my all-time favourite books. Everyone who has cracked open their mind and wants some decent food for thought ought to tuck in.